On the occasion of Diamond Jubilee Celebrations of College of Veterinary & Animal Sciences, Mannuthy, Department of Veterinary Pharmacology and Toxicology organised a One Day National Workshop on Veterinary Homoeopathy in the Seminar Hall of College of Veterinary and Animal Sciences, Mannuthy on 25th April 2016. The programme was inaugurated by Dr. T.P. Sethumadhavan, Director of Entrepreneurship, Kerala Veterinary & Animal Sciences University. During his inaugural address, Dr. T.P. Sethumadhavan emphasized the use of homeopathic medicines in animals that can lead to decrease in the cost of production which will be beneficial to the farmers. 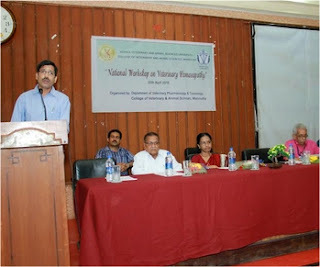 Veterinary College Faculty Dean Dr. Sisiliamma George presided the function. Convener Dr. Usha P.T.A, Organizing Secretary Dr. Bibu John, Dr. P.K. Naveen, Dr. P. Ramankutty and Dr. Sujith S. spoke on the occasion.Dr. Sujith Singh Makker and Dr. D. Balakrishan Rao gave classes on homeopathic treatment for cattle, goat & Canine diseases. A detailed panel discussion on homoeopathic remedies in veterinary medicines was also held. Dr. Sujith Singh Makker, a veterinary homeopath from Punjab, said at a time when holistic therapy was emerging across the globe, homeopathy medicines had a significant role in livestock production. Leading experts in the field of Veterinary Homeopathy presented papers.Around 100 Veterinarians participated in the Workshop. Inaugurating the programme, T.P. Sethumadhavan, Director of Entrepreneurship, KVASU, said the varsity had launched a postgraduate certificate course in veterinary homeopathy, a first for veterinary graduate.